I’ve heard that before. The last time was when I was about to set off on a 30km bike ride around Rottnest Island a few years ago. I was ready to go, had my water, my camera in my backpack and then I suddenly doubted whether it was such a good idea after all because the weather was looking a bit dodgy so I checked the forecast which said it was going to rain, but I’d been looking forward to it so much because I love doing that ride, the peacefulness of having long stretches of road just to yourself, to go however fast or slow I wanted with no-one else to answer to or complain if I stopped for yet another photo opportunity and the magnificent views all around so I must have looked quite disappointed, all dressed up and nowhere to go and my husband piped up: “It won’t rain, you’ll be fine”. I looked at him very sceptically and doubtfully (the menacing clouds were there for all to see) and he repeated: “It won’t rain, I promise” with such conviction that I decided that I might as well risk it. I had a water resistant (note: not water proof) jacket and my backpack has a water proof cover so I knew that the camera would stay dry so off I went on my little adventure. For the first 15 minutes or so it didn’t rain but I was watching the clouds becoming darker and darker, threatening to rain and then the heavens opened. Since the forecast wasn’t for persistent rain I thought the shower will be over quickly and I kept going but within a few minutes I was absolutely soaked, and then I decided I may as well finish the ride seeing that I was already drenched and couldn’t really get any wetter than that. At the western tip of the island the rain abated for a bit and I was able to take the camera out and get a few quick photos and then it was back on the bike and keep going because it was cold but all the while in my mind I could hear Ironman saying: “It won’t rain, I promise” and since this wasn’t the first time I got soaked to the skin while out cycling on his weather advice I decided not to listen to his predictions in future. The previous time was during our short visit to Perth in August 2004 and we’d hired two bikes to ride around the Swan river (just a short 10km ride) but the weather was not promising and about 10 minutes into that ride there was such a downpour that we were wet through within seconds. We finished the ride and it was all quite an adventure until we tried to walk back into the hotel unnoticed, through the lobby and to the elevator with shoes making a shloshing sound and leaving a puddle with each step, trying to look like it was entirely normal to walk into posh hotel lobbies with dripping wet clothes and hair and pretending to look a bit more dignified than the complete drowned rats that we were! 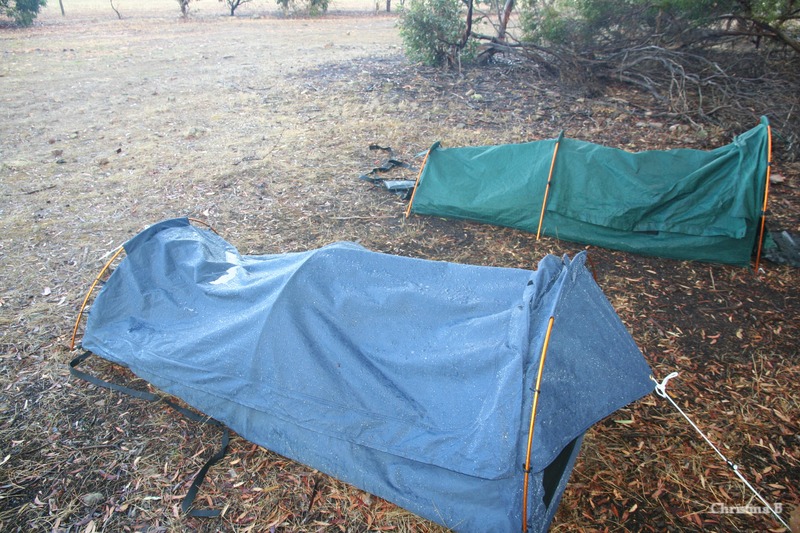 So when we planned our camping trip to Mount Trio Bush Camp in the Stirling Ranges and I noticed the weather forecast said that there was a 60% chance of a thunderstorm on the Saturday, I was naturally a bit apprehensive because we were going to sleep in swags. I love sleeping in a swag because you’re in a little cocoon and if it’s dry and not too cold you can unzip the top and sleep with it open under the stars, which is fabulous. 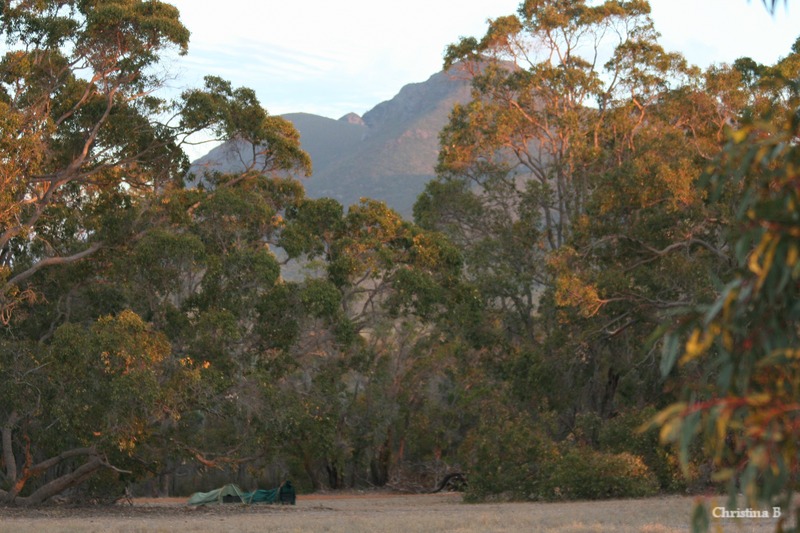 We’ve been to this camp before and it’s rustic and quiet if you avoid popular weekends, which makes it all the more peaceful to wake up to the sound of birdsong and a view of the mountain. The thing is I’ve never slept in a swag in the rain and had had my fair share of getting wet while camping (It’s no use all of us getting wet), and since you climb in and out of the swag at the top everything would get wet if you got in and out in the rain, so I was worried about camping in wet weather, but my man reassured me: “It won’t rain on that side of the mountain” (I should have known there was no scientific analysis of detailed rain data in that area from which this was deducted, it was purely a gamble to get me to go, and it took me just one day there to prove the opposite), and when I didn’t look convinced, the trump card came out: “It won’t rain, I promise”. As if that promise of fair weather would weigh more than scientific rain data on that side of the mountain (and the promise of his weather predictions had proven itself wrong in the past) but I decided to risk the rain, which I was sure there was going to be some of. 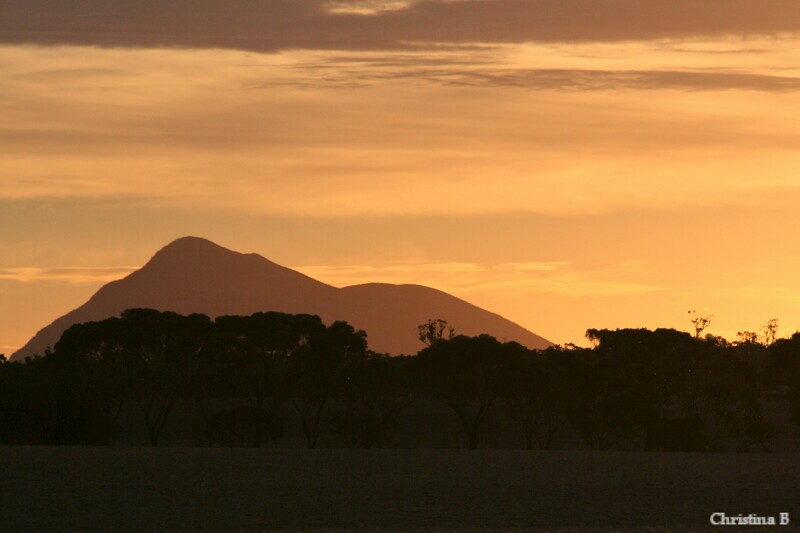 Friday afternoon saw us driving through innumerable and large swarms of insects on our way there which – in hindsight – was the first sign of rain to come but it was a beautiful, wind still evening with not a cloud in sight. A strong wind came up during the evening but it was still clear as, we did some star gazing and a friendly fellow camper helped me take some photos of stars. When we went to bed I hoped that we’d dodged the rain bullet and kept the top flap of the swag unzipped and drifted off to sleep peacefully and the wind even died down overnight until I was woken up by drops of rain falling in my face around 4am. (And no, the mountain hadn’t moved since we went to bed, it just rained on that side of it.) Once I’d zipped it up I was snug and cosy inside the warm swag and I fell asleep once again, this time with the sound of rain softly falling on the swag and everything stayed dry inside so all was well with the world until I got to the campers’ kitchen on Saturday morning to discover that my jolly swagman had forgotten to pack the coffee. The first (and probably last) time I left the packing up to him and he forgot the one thing that could potentially make me lose my sense of humour, so we had a shower and drove to the nearest town (50km away) for a lovely coffee. Morning saved and sense of humour intact. The rain persisted on and off throughout Saturday (exactly as the forecast predicted) and it was clear that it definitely rained quite a bit on that side of the mountain – which I duly pointed out. Saturday night was very stormy with strong wind gusts and hard rain which kept waking me up but I stayed warm and dry, rugged up underneath the duvet even though the inside of the cover of the swag was completely wet and I fully expected water to start dripping in my face at any given moment, and I thoroughly enjoyed the adventure of it all. I have to admit that the fact that I knew I had an out – I planned to go and sleep in the car should it get wet inside the swag – meant that I was never too worried about the weather, but I knew it was going to be a rainy weekend despite Ironman’s best efforts to convince me otherwise. I’ve forgiven him his promise of no rain, I never believed it from the start anyway. Jy moet partymaal ook hare op jou tande hê ! Maar ook lekker by nagedagtenis. Yes, definitely not a combination I thought very humorous!